As a national and cause-neutral organization, we issue grants to an outstanding variety of charities working in all 50 states and nearly every country, a reflection of the diversity of our donors and the breadth of causes that are important to them. We are in a unique position, as one of America's top grantmakers, to help many nonprofit organizations thrive, while supporting our donors' philanthropic goals. Since inception, we have granted more than $6 billion to charity. In fiscal year 2016, our donors granted more than $704 million to charity, an average of over $57,000 per account. The potential reach of each grant—food for struggling families, college scholarships, or health screenings for a community—can have both an immediate and lasting charitable impact. Track inception-to-date dollars granted in the total charitable impact box, and take a look back at 10 years of our donors' granting trends. Giving to charity with your philanthropic account enables you to tailor and time your support based on your preferences and goals. 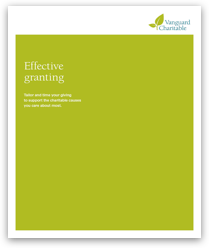 Recommend a grant at important milestones or during a special fundraiser or project. Build a relationship with one organization or support a wide variety of charities. Recommend recurring or one-time grants. Request anonymity or recognition with each grant, and protect your privacy when desirable. We handle required due diligence and review all recommended grants against IRS guidelines, so you can be confident your contributions are helping compliant organizations in an efficient and timely manner.